Submitted by eddiebeale on Mon, 08/04/2008 - 16:50. Please visit this web photo gallery and take the time to upload any pictures you may have from Saturday. As always, Michelle and I were VERY happy to see everyone. Submitted by calebelacnamdacadman on Thu, 07/31/2008 - 22:26. I know Martha's are much farther along than mine, but mine is late to begin dining on cherry. Amazing looking critters. Submitted by eddiebeale on Sat, 07/26/2008 - 06:35. 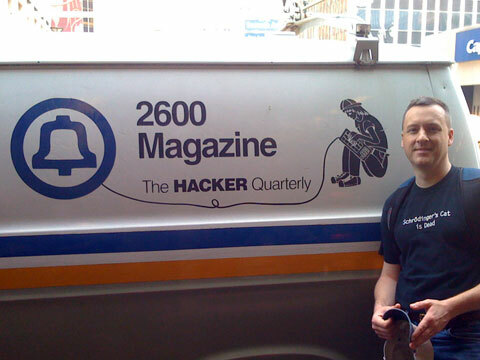 Eddie attended The Last Hope, a hacker conference in New York City, with his friend Sean. New York city in the summer time is hot and stinky, but spending a weekend in the city is always a good time. The Hackers were some of the nicest people I've ever met. They were helpful, interesting, and left each other alone. One of the most interesting talks was given by Algormor, who decided to put a camera inside his luggage to film what the TSA was up to behind the security perimeter. I linked to his site from my new site, bagcam.org. Some really cool video there! Submitted by wbeale on Sun, 07/20/2008 - 08:02. Ever since dear Aunt Abbie gifted Evan for his 4th birthday a camping set (complete with a tent, sleeping bag, inflatable seat and flashlight) he has been pestering us to use the stuff the way in which it was intended. Last night we did just that and in planning the event we took a very rare journey into the shopping mecca which is the Manchester/South Windsor area in order to retrieve the necessary items for a minimalist adventure. Where better to accomplish this than LL Bean! Submitted by Marthapb@hotmail.com on Tue, 07/15/2008 - 07:27. This recipe is from Mom and Sharon -I never knew where it originated-but it is VERY GOOD! The first time I tasted it was when, many years ago, Mom brought both raspberry and blueberry pies to The Clambake (Janice and Allan's}. Any fresh ripe berry is Very Good. I have even had success with peaches diced and some juice drained and thickened with the cooked cornstarch part. Submitted by Aunt Sharon on Thu, 07/03/2008 - 11:50. So many uses for pesto when you love a bit of raw garlic !! Submitted by Aunt Sharon on Wed, 07/02/2008 - 23:42. It only takes a few hours to get there by plane, and when you arrive you're in for a big treat. Richard and I went to Seattle two weeks ago and had a super time, arranged by our personal tour guide, Nathan. He met us at the airport and escorted us to our hotel. Since our visit was in early spring, this writer was delighted with the seasonal flowering of familiar and unfamiliar plants. The very modern city is infused with parks, gardens and larger public forests and open spaces. Submitted by Aunt Sharon on Wed, 07/02/2008 - 14:40. A refreshing fruit dessert, old fashioned and easy to make. Submitted by calebelacnamdacadman on Tue, 07/01/2008 - 13:29. Just one left: July 30 in Manchester. Submitted by calebelacnamdacadman on Tue, 07/01/2008 - 08:45. All three black swallowtails that we raised have successfully flown away and now we have two different instars of spicebush swallowtail that are about a week apart in age. I love how they have such different coloration and was excited to catch a shot of them together as they don't stay in one place too long.